My friend Scott, who is an aficionado of cover songs, was kind enough to make me a mix CD, including a set of amusing and insightful annotations. I prevailed upon him to be a de facto z=z guest blogger and he graciously agreed; I’ll be posting some of the songs, together with his notes, over the next few weeks. Further proof that indie rock stars can occasionally be just as pretentious and minutia-obsessed as some of their fans. God forbid you’d cover a Bruce Springsteen song that somebody had heard of, or even a lesser-known track from one of his hit albums. No, “Mansion on the Hill” is a track that never charted from one of Springsteen’s least-popular albums, Nebraska. If it didn’t sound so good, I’d ask for my money back. 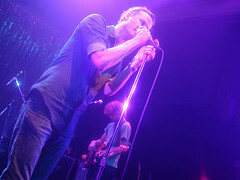 Image: The National by Flickr user faithdesired, reposted here under its Creative Commons license.